Well at Tough Mudder we also like you to choose your own journey……. If you’re not up to the Tough Mudder Full 16+k distance, then we have the perfect introductory event with just 8km of muddy obstacles, the Tough Mudder Half. You can even split your team with some doing the Half and some doing the Full. You all start together and then meet back in the Village for that refreshing 4 Pines beer. Don’t quite feel up to a chilly Arctic Enema experience or haven’t trained enough for the Funky Monkey bars? Its ok! All of our obstacles have a by-pass lane (without those burpee penalties), so you can come back and kill it next year. UP FOR MORE OF A CHALLENGE ON COURSE? There are plenty of obstacles on course where Mudders need your help. 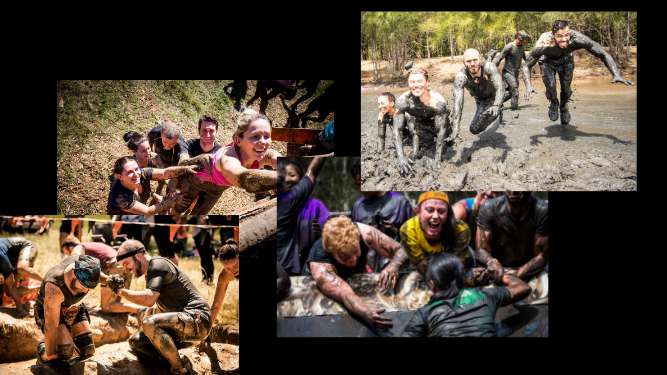 Be it simply a word of encouragement or the strength of your arms lifting Mudders up Everest – you decide how long you stay and help a Mudder. So…what will your story be?